Used over any effective heat source, the All American Non Electric Sterilizer 1941X provides dry sterile dressings and instruments, with all bacteria and micro-organisms destroyed, in a matter of minutes. Only All American Sterilizers feature an exclusive, precision machined "Metal-to-Metal" sealing system. Positive action clamping locks align the cover to the base forming a steam tight seal. Because no gasket is involved, the cover is always easily opened and closed. 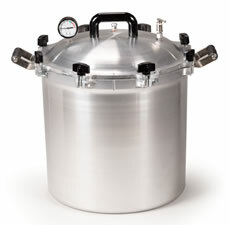 Only a small amount of water is needed to create the dry steam. After achieving a minimum temperature of 250°F(121°C), and a pressure of 17psi, the dry steam penetrates the bandages or instruments, making them sterile in 35 minutes** and ready for immediate use. No wiping is necessary to remove chemical residue or moisture, and cutting edges are not dulled.